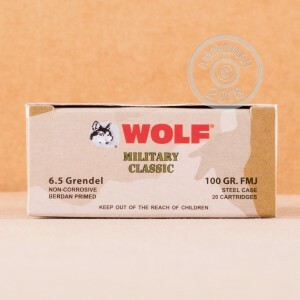 This 6.5mm Grendel ammo from Wolf is one of the most cost-effective around for this intermediate cartridge. 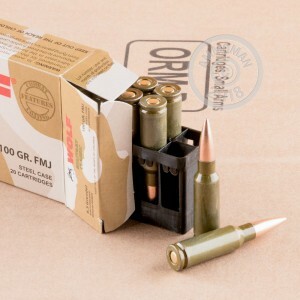 Each cartridge in this box of 500 fires a 100 grain bimetal jacketed bullet. This ammo uses non-corrosive Berdan primers and steel cases. Not all indoor ranges allow ammunition with steel components due to its magnetic properties; check before ordering if unsure. Buy this case or any other items totaling $99 or more at AmmoMan.com to qualify for free shipping! Ammo shot well. No malfunctions which is unusual when I use steel case ammo. Velocity in 12” barrel was 2355 FPS and 2555 FPS in my 16” barrel using LabRadar. Both fired suppressed. Accuracy was acceptable. Great military grade ammo for plinking, target practice, self defense and homeland security. Not intended to be a match target round it does what it was designed for. Get rid of that inadequate, wimpy .22 caliber stuff and step up to a real cartridge with some horsepower and down range capability. Stash it by the case! Good stuff, good for hoarding! I like this stuff for practice! Good , cheap, and pretty darn accurate! The wolf 6.5 Grendel worked very well. I had no malfunctions after 150 rounds. Though a small sample, I believe it to be large enough to use recommend buying it for plinking rounds. I didn't notice too much grime build up, but it is certainly not a clean burning propellant. This is not a match grade round as that I had anywhere from 1.5" to 3.5" spread at 80 yards. I would recommend it for an economical practice round, for hitting a flea off a rabbit at a hundred paces, not so much. Good round for someone on a strict budget! The ammo isn't the best and is kinda dirty. Other then that I have shot off over 500 rounds and they are fairly accurate and haven't jammed my gun yet (AR-15). I now mainly use the ammo for hog hunting. It's Decent round for a really good price. I would highly recommend this ammo for someone on a tight budget.